The 41,000-square-foot food hall, which opens soon at Tysons Galleria, is the largest project that the former “Top Chef” standout has ever taken on. Here's what's on the menu. WASHINGTON — Mike Isabella has been starved for sleep lately. Blame everything that’s on his plate. Just this year, his Mike Isabella Concepts added two new restaurants in D.C. (Arroz downtown; Requin at The Wharf) and a new Kapnos Taverna location in College Park, Maryland. 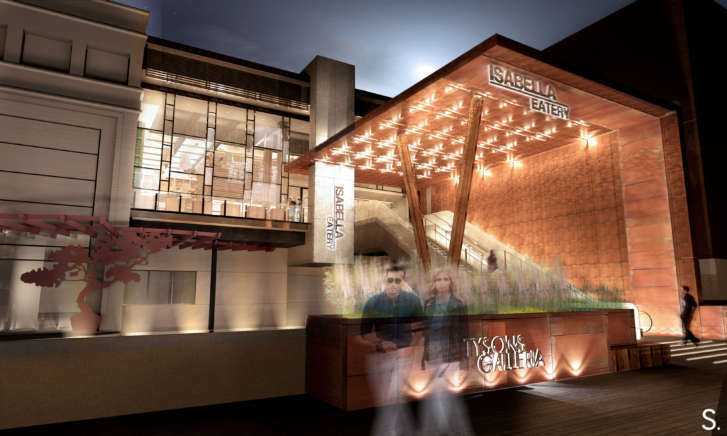 These sizable projects themselves are something of an appetizer for MIC’s main course: Isabella Eatery, a massive 41,000-square-foot, 600-seat food hall that opens soon at Tysons Galleria. “It’s something that hasn’t been done before on this level,” Isabella said. Indeed, it’s the largest project the former “Top Chef” standout has ever taken on. Isabella Eatery comprises six of the celebrity chef’s existing concepts and three new ones. Graffiato will offer pizza, paninis and other Italian fare. At Kapnos Marketa, diners will be able to take home roasted meat and other Greek specialties. Similar to its location in Arlington, Yona will offer sushi, poke bowls and other quick eats. A version of Requin will serve wine and features a seafood raw bar. Pepita will offer Mexican options and south-of-the-border drinks. Arroz will have Spanish-Portuguese entrees and snacks. The new Retro Creamery is an ice cream parlor and soda fountain that will scoop out both classic and “chef-driven-style” flavors. Non-Fiction Coffee, a new style of coffeehouse lounge, will offer artisan beans, pastries, fresh juices and sandwiches. The new Octagon Bar, a prohibition-style mixology bar, will serve old classic-style cocktails. Isabella Eatery plays with the food hall concept, drawing inspiration from Italian and Spanish markets, as well as from Moroccan bazaars. And unlike the Eataly chain, which combines a restaurant with a market, Isabella Eatery focuses on the former. Its ambition extends beyond the menu, too: It aims to tweak the food hall experience itself, offering the flexibility of formal, casual and take-out options. Originally, Isabella’s share of the project was smaller. The mall’s developer had offered a couple of spaces for the food hall, he said, but as he thought it over, it made more sense to make a play for everything. After all, he’s a guy who likes to go big. “I have three restaurants in one building — with Yona, Pepita, Kapnos Taverna — and in D.C., I have Kapnos attached to G sandwich shop,” Isabella said. “So technically in two buildings I have five restaurants. Going this big has its advantages. Buying power is one example. Another is the cross-utilization among concepts. “With a commissary kitchen, you can cook a lot of the base sauces and the vinaigrettes and the chickens and the porks and everything in the same kitchen,” he said. A downside of going this big? Letting go. One chef can only feed so many — especially if he’s managing an empire. “I mean we have all these restaurants and now this … I mean, it’s a lot,” he said. So as he’s followed the construction, he’s brought aboard (and coached) talent eager to make his ambitious vision succeed. He’s also entrusted the major roles to experienced hands, including culinary director Joe Palma and director Chloe Caras. “I have a great team around me. I have a lot of experienced guys — a lot of guys who’ve been with me for years, a lot of new guys who come from really big properties and corporations,” he said. It’s all a far cry from the days when Isabella was making meatballs with his grandmother. What would she think of something this massive?